Bee societies: battle of the sexes! Posted on July 16, 2016 at 10:42 am. Some bees are solitary and some bees are social. There are many species of solitary bees, such as carpenter bees, which do not live in colonies, but rather, each female creates her own nest and raises her young alone (or sometimes with the help of her older daughters, in the case of the carpenter bee). These types of bees do not make honey or honeycombs, but use non-bee-conventional means to help construct their cells for their eggs. 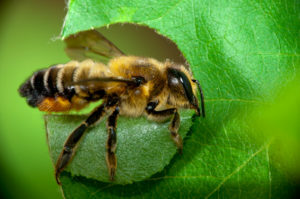 The leaf cutter bee, for example, uses leaves that she cuts from nearby trees and bushes, and the mason bee uses mud! 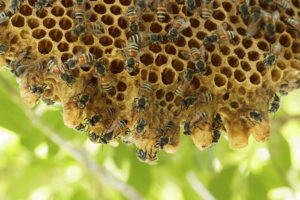 There are also many species of social bees, such as the beloved honey bee, which live in colonies and work together to provide for the rest of the colony. Each bee has a specific role that they serve: queen, worker, or drone. Queen: The queen bee earns her title by being at the center of the colony, her large size a symbol of her status. In a given colony, the queen is the only fertile female. Her job is to lay eggs, which she does well! After mating with several males (males which have either wandered into the hive, or which she must leave the hive to find), she has enough sperm saved up to last her for quite some time, and she’ll lay about 1500 eggs per DAY! Wow! Queens live for 2-4 years and in that time she will almost never leave the hive, unless it’s with a swarm to make a new hive elsewhere. A queen bee comes from an ordinary fertilized egg, just like a worker bee, but is fed a special mixture of food called the “royal jelly” when she’s in her larvae state. Worker: Worker bees make up the overwhelming majority of bees as there is only one queen per hive and very few drones. All worker bees are female which means almost every single bee is a lady bee! Female bees are also the only bees that have stingers, as a stinger is part of the female bee reproductive system — if workers were fertile, they’d be able to lay eggs from their stingers! You can spot a worker bee buzzing around in a flower collecting pollen and nectar, constructing the honeycomb, protecting the hive, taking care of the young, etc., etc; It comes as no surprise that worker bees do most of the work that it takes to keep the colony alive and thriving. Drone: Drones are bees that have developed from unfertilized eggs. All drones are male, and their one and only job is to mate with the queen. Drone bees don’t collect pollen or nectar, nor do they have any function within the colony other than to mate. Male bees drift from colony to colony and, once a drone has mated with a queen, he dies. If a drone bee hasn’t mated by the time autumn comes, he hasn’t cheated the system. The worker bees will eject him from the hive, where he’ll soon die due to the colder weather. Life is tough for a drone bee.